In the heart of the beautiful Scottish Borders lived a girl with a vision. A vision to add a little colour and sparkle to everything she touched. She got together with some like-minded people to bring to you a local market, with a difference, a local loving difference. Welcome to the Colourful Edits, a collaboration with lovely people, passionate about their industry and excited to share ideas and happenings with you. The Colourful Edits is a local market, that features the work of independent makers and designers from across the Scottish Borders. Founded this year, The Colourful Edits has the potential to grow into something rather wonderful. 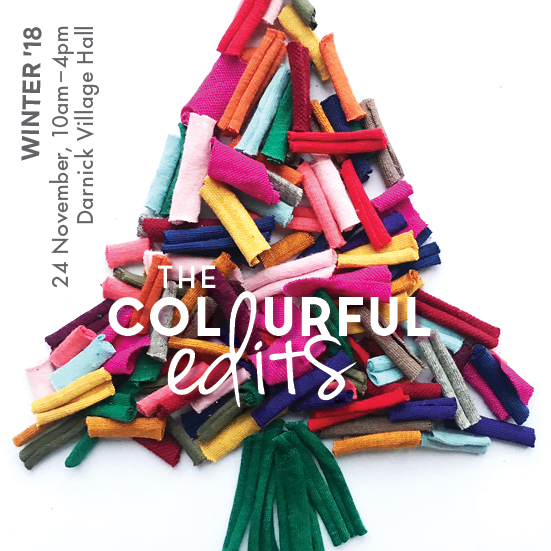 More of a gathering, than a market, this event will combine design, colour, style, trends, delicious flavours and scents, great refreshments and a fun community spirit under one awesome roof - inside the beautiful Darnick Village Hall. The hope this Winter’ 18, is for us to look after and CELEBRATE the women in our lives. This market will give you the chance to get together with your friends (without the kids! ), shop, have a nibble and work on your personal Christmas wish list. You can even persuade your hubby or partner to come down for an hour of secret shopping, as we are offering personal shopping stylists who will be on hand for those who require help. Just hand us over your wish list! An opportunity to learn and make time for you. What can you expect? Well, on arrival you will be greeted with a warm smile and a delicious tipple of (non alcoholic) mulled wine. You will be given a map for the vendors which will include your schedule of demos. From here you can choose whether to shop first, snap up the seasons key pieces from all the lovely vendors, hit the ‘Gin and Prossecco’ bar provided by the fabby Selkirk Distillers (yep, there is alcohol at the ready! ), enjoy a mouthwatering nibble from Shona at The Selkirk Deli or opt for sweetness first - as the fabulous Ruby and Pearl Cake Art will be showcasing delicious delights! 2hrs 45minutes of YOU TIME! An idea of what to expect; Please check our website for much more information. A warm welcome, as you sip on some delicious (non alcoholic) mulled wine and peruse what we have on offer! Get inspired by Lauren’s key colours for the season. Here you will see how we are teaming our neckwears and looking at key fashion trends in store. We will be using real life models to showcase our different looks. Crowd participation required! Learn top tips in Wreath Making when artist Jennifer Borthwick demonstrates ‘how to’ make a wreath. Create your own pom pom with help from the lovely Katharine. Chat to Shanni Burns about her wonderful new venture 'The Loft' all the while getting your hands massaged! Treat your eyes and taste buds to some lovely local produce and find out key tips on recreating that perfect meringue, tablet or mince pie. Or hey, you could just buy from the lovely vendors! Recreate a red lip, master a smokey eye, get a natural glow without overdoing it. Watch and learn from the experts in the field! Selkirk Distillers will have a Gin and Prosecco Bar available starting from 11am, if you fancy a few drinks. *There will be a charge on the day (separate from ticket price), if you fancy having an alcoholic drink, getting your nails painted or having your hair curled!